This all-purpose container is constructed of BPA-free copolyester material. 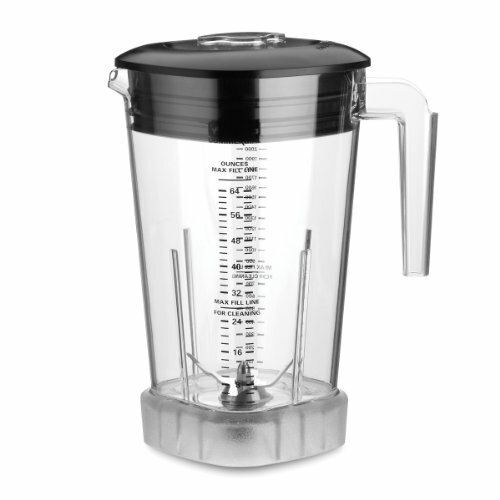 It is designed to use with Xtreme hi-power blender model MX1000XTX. It is ferocious enough for everything from smoothies and frozen drinks to thick spreads, desserts, dressings and all types of food preparation. Features ultra-aggressive blade and jar design delivers smoother consistencies and faster results. Unbreakable, stackable and dishwasher safe. Includes easily removable container cover with removable clear cap for adding ingredients and pressure reduction during hot food blending. Its high-performance, high-impact stainless steel blade is easily user replaceable for servicing. Available with 64-ounce capacity.